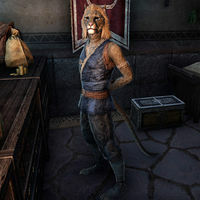 Azazi is a Khajiit pack merchant who runs Pilgrimage Packs in the Tanners and Miners Hall of the Canton of St. Olms the Just in Vivec City. "This one doesn't know what to think about his Telvanni customers. On one paw, they keep people like me as slaves. On the other, their pouches overflow with more gold than this one has ever seen. What to do? What to do?" "Bugs and mushrooms as big as houses and guaranteed to scare the stripes off a kitten! This one doesn't know what in the name of Jone and Jode the Dark Elves were thinking when they decided to live in this bizarre land. By the way, do you need a bag?" "This one brings satchels and backpacks from the far corners of Tamriel, and each and every one is perfect for your carrying needs. Let's do without the usual haggling and get right down to the exchanging of gold and product, yes?" This page was last modified on 24 February 2019, at 00:06.